When it comes table decorations, the place settings you pick can make the difference between an ordinary wedding dinner table and a memorable, thought-out presentation. Fortunately, there are plenty of creative ideas out there for couples that want to keep the wedding day dining experience dynamic. Organising a seating chart for the wedding can be one of the hardest planning jobs of all for couples. Placing the right guests at the right tables to make sure everyone has a great time is a task in itself, then making the tables look suitably inviting adds a whole new set of challenges. To inject some fun into the task, why not choose a selection of new ideas for place settings that will help entertain guests and even act as ice breakers for each table. Original settings can also help give your overall décor make more of an impact, especially if they tie in with the wider design theme of your wedding day. If you are getting married in an exotic destination like Thailand, the odds are that you love travelling the world, and you could probably say the same about your guests who have travelled thousands of miles to celebrate your union. In that case, why not make travel your décor theme? Allocate each table with a country that you have visited as a couple and shared special memories in. The place settings could be miniature snaps of you and your bride/groom-to-be enjoying the trip, or even cute rustic postcards showing your guests’ names, all from places you have visited as a couple. If you have a lot of friends and family joining you to celebrate your wedding, it’s possible that some of your guests may not know each other very well. 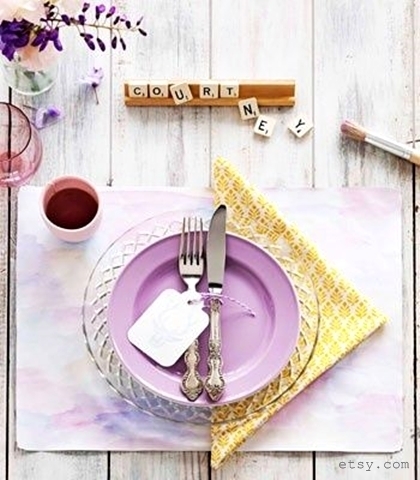 Scrabble place settings are therefore a great idea as each guest can contribute the letters from their own name to a scrabble board in the middle of the table, and work out who can create the longest word from all of their names. 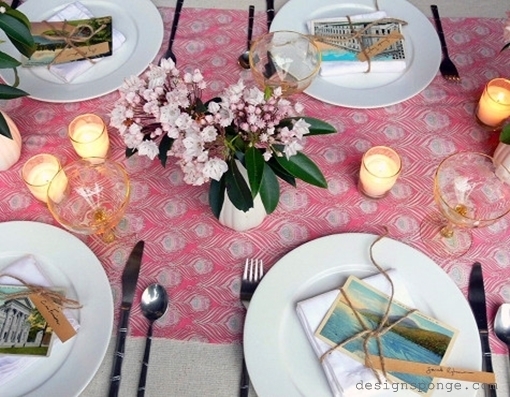 It’s a genius way to get people talking, and a cute way of laying out your tables to boot. If the stunning coastal scenery of Thailand has inspired you to decorate your wedding using a “seaside chic” theme, then elegant oyster shell place settings are the perfect choice. 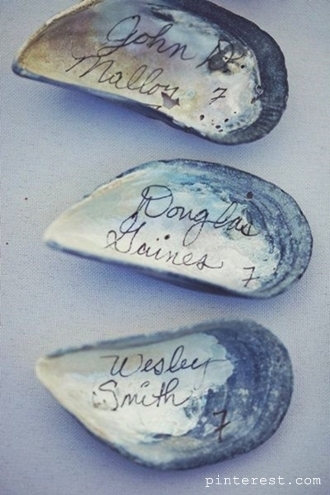 While an oyster shell may look a little rough on the outside, the inside of the shell resembles an elegant, smooth piece of silk that is easy to write on with a gold or silver marker pen. Once you have cleaned your oyster shells, bleaching them will remove any remaining dirt and eliminate lingering aromas to make sure they light up each guest’s place at the table. 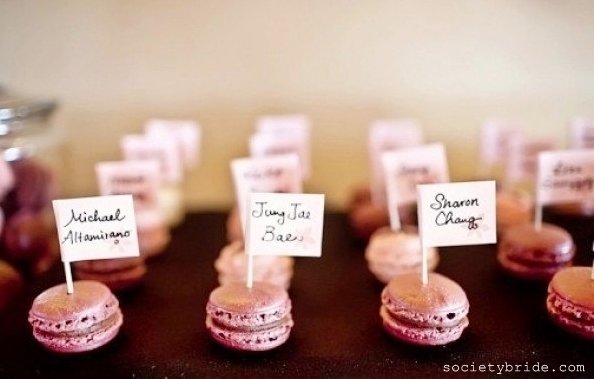 Sweet, edible place settings are a great idea because they can act as party favours too. Even for a destination wedding, fans of brightly coloured macaroons or a festive rainbow of iced cupcakes will be pleased to know that wedding planners know all of the best local bakers to get hold of exactly the sweet treats you want. Bearing in mind the all-important colour theme, you can even create simple name flags out of cocktail sticks and coloured paper so your guests can easily see where they are sitting. Meals that feature multiple courses can often be a chore for little ones, so to keep them entertained at the table, it’s a good idea to get creative with their place settings. 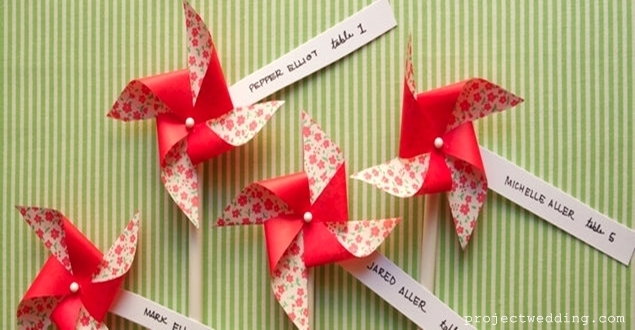 Pinwheel place settings are great fun for kid when the sea breeze kicks in. You could also provide goodie bags with toys, stickers and craft materials for children to play with at the table once the food is finished.